This morning’s motoring maladies centre on heating, family plans, autonomy, chimney sweeping, drivestrain and twenty-four more. I have a 2001 Ford Focus diesel with 120k miles the heater of which has stopped working. Any simple ideas apart from burning it to get some heat? It is very common for the electrically operated heater valve between the engine coolant pipes and the heater matrix to fail. My daughter has a 2009/59 Renault Clio Extreme 2-door hatch, owned since new. She has just given birth to her second child and now needs two car seats in the rear. This is a huge problem for her and very difficult to manage in addition to the potential safety issues. Being a young couple with limited funds it is now crucial that their choice of a suitable replacement vehicle is viable and economical. Can I please seek your advice on their behalf for a 4-door, possibly crossover type, with adequate access and storage to a maximum budget of £10k including any possible trade-in? A Honda Jazz 1.4iVTEC 5-speed manual or CVT-7 makes a lot of sense. Very versatile. Very practical. Very reliable. Alternatively, either a Hyundai ix20 or KIA Venga (essentially the same car), either 1.4 or 1.6 petrol. Best to avoid diesel. These are slightly more upright than the Jazz requiring less bending to lift the children in and out of the back seats. If she wants to stick to Renault then a Captur has a lot of advantages, including seatcovers that can be removed and washed. My wife and I bought a 2-year old FIAT 500X 1.6 Diesel Crossover SUV (WT15 VEL) on 01/05/2017. Soon after, I noticed that when I took my foot off the accelerator travelling at say 50-60mph, the car slowed down to 30mph and climbed to 35mph on its own. I took it back to the Edinburgh dealer one morning and collected it at the end of the day. I was given a breakdown of what was found and all it said was that the car was taken on a road test and no fault could be found. I was also told by telephone by the same dealer that it was a "Characteristic of the Vehicle." I contacted FIAT in Italy and was told to take the car to another FIAT dealer, which I did, only to be told they couldn’t fault it either. I find it hard to believe as I have spoken to 2 other owners and they say they don’t have the same problem, so how can it be a characteristic of one FIAT 500X and not another? I was also thinking what if I was to have a blackout at the wheel? The car would slow down to 30 pick up to 35 and continue on until it was stopped by other means: an accident that could be catastrophic. The phenomenon you describe would happen because there is a minimum speed at which a diesel engine will run, so, if you want the car to run more slowly, then you have to change down a gear or two so the engine is still running at revs it is comfortable at. I bought a new Subaru XV diesel in September 2016 that now has 15k miles. Starting at about 3k miles, and recurring approximately every 3k since, the DPF filter warning light flashes which indicates a return to dealer required. Each time it seems diesel has been injected into the sump needing an oil change and they turn off the warning light. The dealer tells me that so far they have borne the cost of this as Subaru put it down to driving technique and don’t recognise this as a warranty claim. The dealer is saying now I have to pay. The DPF light has come on solid a few times and then gone off indicating a regeneration occurred. This last time the flashing light came on, diesel injected into the sump and then the light went off. Rather worrying as, if I hadn’t checked oil levels, I could have thought regen occurred and all was well. My driving style is a mix of short journeys (which I try to avoid), more frequent 15 mile runs and occasionally much longer. One time I drove 200 motorway miles and the DPF light then flashed with oil in sump. The dealer put this down to short distance driving prior to that journey. I like the car a lot except for this. My question is, if the dealer and Subaru are correct in expecting me to bear future cost, is it likely to be a different fault from the DPF, considering the frequency. Have I any recourse against the dealer? I wanted to keep the car for 100k miles but now may have to sell with massive depreciation. We have a 2010/60 petrol Qashqai N-Tec 4WD CVT with 74,300 miles, bought from our local Nissan dealer ex-demonstrator and serviced by them. On a recent journey the '4WD' logo lit up on the dashboard for no apparent reason. The car was not in four-wheel drive. The dealership was contacted by mobile immediately and they advised to drive to them. On arrival, they decided a diagnostic examination was necessary and a booking was made. The said it was all right to continue driving in the meantime. The appointment was kept on 14/11/17. Their diagnosis, as written on their Invoice, states: “Plugged in vehicle fault with 4WD system, fault 4x4 actuator carried out live data on consult and 4x4 knob working but not engaging system. Transmission control module required: £1,494.48 inc. Payment in full was demanded and paid by Barclaycard. When the module was received about 10 days later the car was booked in for an hour for fitting-included in the price above. An hour and a half later a courtesy car was offered FoC since “their computer would not liaise” with the new unit. The car has been with them ever since and they are still having trouble “programming.” They are in touch with Nissan HQ. Can you shed any light on this saga please? We have heard there have been recalls but are not sure if they were anything to do with our problem. A bit of a dilemma since, presumably, the fault may not have necessitated the expense incurred? There have been a lot of CVT problems with this model. But I wonder if the '4WD' issue might be due to a disparity between the circumferences of the tyres front to back. A tread depth difference of 3mm can make the ABS controlled system think that there is slippage with one or more of the wheels when there is not. This can permanently damage the system or may simply throw up a temporary fault until the tyres are equalised. Another similar problem was reported a couple of days ago. My 2010/60 reg Jaguar XF has done only 16,000 miles. Everything is fine, except the air-con has just packed up, with holes in the radiator. (This also happened in my last S-Type.) Shall I keep it or would it make sense to part exchange it now before, the heavy cost involved? My Ford Kuga has suffered a serious engine failure. A cylinder casing developed a crack that caused water to leak into the engine. The fault was diagnosed by my local car repairer, AA certified with properly trained technicians. Ford is refusing to consider compensation, because the fault was not handled by a "Ford Dealer". The repair would cost me £5,300. Given that the car is 4 years old but has only done 22,400 miles, do you agree that this represents an engine that was not "fit for purpose", given that the root cause was a latent metallurgical fault? Cooling system and water pump were in good working order, and the car was regularly checked and serviced. The fact that the problem was diagnosed by an independent does not prevent you transporting the vehicle somehow to a Ford dealer where the Ford dealer can diagnose exactly the same problem. No manufacturer will meet a warranty claim identified by an independent garage. While extremely happy overall with my September 2013 Freelander 2 XS, the SatNav system has been a constant frustration, despite having tried all manner of different preferences. The logic within the software appears to be flawed in that it will recommend an alternative route that inevitably proves to be far slower than the traffic it is trying to avoid. A recent experience on the A34 when other colleagues on the same route (albeit behind me), arrived at work up to 20 minutes before me having followed the instructions on their after-market Tom Tom devices. Is it possible to replace the software within the system rather than pay Land Rover £160 a time to have a map update that does nothing to improve the overall performance of the device? This is a standard flaw with some live satnav systems that identify a jam on your selected route. If their alternative route is jammed, they will then direct you to a further alternative route that may itself be jammed. The problem is not the satnav. It's gridlock. I have suffered from it lots of times, most recently yesterday stuck on the A1 at a point where there weren't any alternative routes so I had to forget the satnav alternative route, drive in the opposite direction I wanted to travel, then drive West and only when I'd done 20 miles or so, re-select the route to get around the gridlock. Here's another example with the very latest system in the very latest BMW: /road-tests/bmw/bmw-x3-g01-30d-2018-road-test/ All that said, the latest R-Link live SatNav system in Renaults will actually show every road with slow moving traffic in the vicinity of the car, even in small towns, so can be very effective indeed. I have a 2011 VW Golf 1.6TDI. My dilemma is: do I hold onto it for a few more years, as I normally do with my cars, or do I look to trade in and replace it with a petrol model? I have been a Golf owner for years and normally buy second-hand from the local VW dealer. 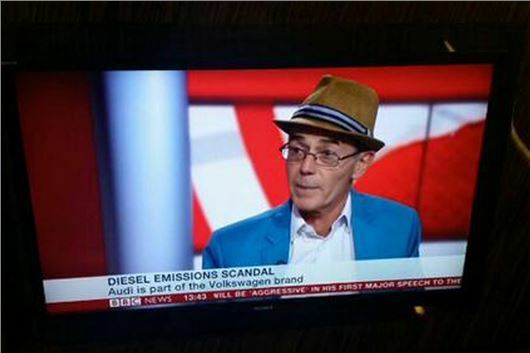 I'm concerned whether my car would have any resale value because it is a diesel. I'd move your Mk VI Golf on as soon as you can before it starts costing you serious cash, despite the 'warranty' to fix any problems consequential of the diesel emissions fix. More than 200 complaints about the model persuade me it was never a good car. I have a 2011 Range Rover Sport 5.0 supercharged, fitted with Continental 275/40 R20 105y tyres, which I think are all season tyres. They are great on anything solid, but rubbish in the snow. I have some Pirelli Sottozero 3s on a 2016 Fiesta ST. They were the only winter tyres in the ST’s size. I’m not disappointed in them, but neither am I so impressed that I’m not asking around when it comes to the Sport for which Pirelli Sottozero 2s are available. If you have experience or feedback to share I would appreciate it. When I say “I’m not disappointed,” I may have my expectations set a bit too high anyway, following a trip to Norway. On un-gritted hard-packed snow covered roads, the Norwegians drive around like it’s tarmac. Normal speeds and so on. They are smooth drivers who employ anticipation, but the cornering and braking whilst descending steep hills demonstrated some magic was at play in the tyres too. Looking at cars parked roadside, I saw a lot of Nokians fitted. I could use some of that ability, hence my comment about the Pirellis. Incidentally, the only time I saw studded tyres, they were on a snowplough. Very obvious, too: they were tearing the surface up. No chains were in evidence. Any advice gratefully received. I've driven Michelin Pilot Alpins on Porsche 997s and Mercedes E63s on 20-inch wheels in the snow and they worked brilliantly predictably. Also crossed the lower Austrian Alps in an F25 X3 on 18-inch Sottozeros and they got us through a blizzard and into Bavaria where the trucks couldn't move on the autobahn. Also been to Finland for some ice lakes and general messing around in RS4s and RS5s on Nokian high performance winter tyres. So I can confirm those three all work, but, being Finnish, Nokian has the most experience. Regarding the fitting of cold weather tyres, attached is the Association of British insurers agreement to which AXA subscribes. As you can see you do not even need to tell AXA you are fitting winter tyres. So it seems like the humble clerk that RH spoke to is unaware of his company’s own policy: a training need there: https://www.abi.org.uk/globalassets/sitecore/files/documents/publications/public/migrated/motor/abi-guide-to-winter-tyres-the-motor-insurance-commitment.pdf/ As the wheels which your reader contemplates are 18-inch rather than 19-inch and are an official VW option, it seems to me that the clerk was just plain wrong. It is usual to go down a size in wheel diameter and have a more sensible profile for winter tyres. I am a retired claims investigator for a leading insurer who also subscribes to this ABI code and I had no problems when I bought a set of 16-inch steel wheels and winter tyres to replace the standard 17-inch alloys. Perhaps you could post this link. Excellent. Many thanks. The problem comes from the likelihood of fitting smaller aftermarket wheels and deeper profile cold weather tyres than the car came fitted with. For example 18-inch with 45 profile down to 16-inch with 55 profile simply because cold weather tyres work better with a deeper profile, because aftermarket wheels are about a third of the price of manufacturer OEM wheels and because deeper profile tyres are also a lot cheaper than low profile tyres. My 2016 Jaguar XF, like all cars nowadays, is equipped with a TPMS. This allows me to check the tyre pressures at a push of a button and warns me if any of the tyres become significantly under inflated. So far, so good. However, the aluminium valve stems used on the system are so fragile that I am now scared to try to add air to my tyres. I’ve already had one valve stem break and let all the air out while trying to add air at a Sainsbury’s petrol station. The RAC man who attended told me I was the fifth that he’d been too in recent weeks. A search on the Internet found these failures to be very common across all makes of cars but didn’t turn up any useful advice on how to avoid them. All Jaguar appears to tell us is to ‘be careful’ and not to use straight air wands. Since every supermarket or other gas station I’ve ever visited uses straight air wands, this is not helpful. Do you have a view on these valves? I gather that having TPMS on new cars is a legal requirement, so I can’t replace the valves with old fashioned rubber ones, but is there a more robust, legal, alternative or, if not, where/how can I maintain the correct pressure on my tyres without the constant real risk of breaking off the valve stem? This is very common and always has been due to mixed metal electrolytic corrosion of the valve stems. Valve based TPMS systems are also extremely sensitive, and I'm having an issue right now over this. But guess what? BMW developed an excellent and reliable method of TPMS using the ABS reluctor rings to sense if a tyre had lost pressure. But the EC imposed a universal tyre-valve based TPMS systems, no doubt after extensive lobbying by whoever makes them, just as it succumbed over replacing reliable R134a refrigerant in a/c systems with unreliable R1234YF refrigerant, presumably after extensive lobbying by the vested interests concerned. I bought my VW Golf from a Welsh dealer that is part of a chain, all owned by the same company with the same head office. For the same 55,000 mile inspection and oil service I obtained three different quotes from three different branches. They were £248; £269; and £331. All included Mobil1 fully-synthetic oil; oil, air and pollen filters; top-up longlife coolant; and a general inspection. None of the branches can explain the huge disparity in prices. Surely the hourly labour rate differential is negligible in South Wales? One branch suggested that I could go for a “Minor Service” at £159, then pay £67.20 on top for the air and pollen filters. This would be £226.20. What is the difference between a “Minor Service” and an “Oil and Inspection Service?” To my mind, fresh oil and filter is a minor service anyway. Am I missing something with the Inspection Service? Standard UK rip-off. Every time I go to Thailand I have a 'fully' synthetic oil and filter change done on our Jazz at the local drive-in lube centre. This costs £50. So there is absolutely no excuse at all for dealers charging £248 - £330 for the same thing. BMW does it too. There are two reasons for this. One is to put owners off changing the oil when it should be changed, thus shortening the lives of engines so cars have to be replaced more regularly. The other is to fleece owners if they try to go against this policy. It's high time that drive-in lube centres were set up nationwide and manufacturers compelled to accept these under their terms of warranty and also to furnish the lube centres with the necessary codes to reset service indicators. We have a Honda CR-V. One very useful feature is that the lack of a solid centre console means we can slide our feet from driver to passenger side if we have to park in a cramped space. Honda changed that a couple of years ago and no other car has this feature. Yes, Honda made a lot of retrograde steps from the very practical 2001-2008 Civic and CR-V. When I asked about this, they gave the reason as 'consumer demand'. People would rather have somewhere to put their mobile phones than the ability to slide across the car and exit from the passenger side. My wife and I have been trying to decide on a replacement car. With so many makes, models and specifications available it has become a growing problem for us. If you could give some guidance it would be most welcome. We have managed to list our criteria as follows: Inside quiet and comfortable, petrol engine (our foreseeable annual mileage circa 10,000), automatic gearbox (preferably with traditional torque converter to avoid all the problem that have been highlighted in the press). Higher seating position of the ‘cross over / suv’ type seems appealing. Age fairy new with a budget circa £17k. Whole in one could look at outgoing Toyota Verso 1.8 auto. Bulletproof engineering and 5 year warranty, good deals around. I still find it amazing that, even after all the problems with DPFs, that NO car manufacturer will go down the same route as with (apparently) HGVs and put indicators on the dash instrument panel to indicate either/both when an active regen is due (X miles/days/hours/whatever if possible) and actually in progress/time left/complete. Given firms and people buying HGVs seemed to be savvy enough to want these, and that manufacturers knew (as a result) they'd kick up a stink if they didn't have them, then there's no reason why we need 'legislation' to get them (no way to do so retrospectively) on new cars in a reasonable time frame - its just informed buyers putting pressure on manufacturers, otherwise they'd get really bad publicity (which the car manufacturers are slowly getting, as, as you say, the car media is much more wedded to the freebies etc that come with 'positive' reviews (or should I say non-criticial ones) from manufacturers. Much (though perhaps not the majority) of the blame still has to go on, I'm afraid to say, stupid, ignorant and naive car buyers who, despite a car purchase being second in cost to that of a home (and even them most don't really look into that purchase in enough detail to spot major problems), does very little in the way of (often basic) research as regards their purchase, other than styling, colour and performance. You only have to look on the forum pages here - some new members, rather than look on the reviews section to find out something, make a bad choice of car, then write in bemoaning their shiny new thing's reliability, only to find that a simple, five minute check would've seen that their usage pattern would be wholy unsuitable for the car bought, or that it has X or Y inherrant reliability issue and has been a 'recommended not to buy'. I personally have no problems in someone at least making a decent effort to find out things, THEN going to a forum or (impartial) experts like HJ etc who can then fill in the blanks or put them on the right path - its the lazy ones who, in my view, don't deserve much sympathy or help, particularly those who just start arguing with knowledgable industry insiders (such as SLO76) on the forum, basically justifying their (often poor) choice of car rather than actually asking for and heeding advice from knowledgable sources. In reply to the comments from the person with the supercharged Range Rover who was impressed with winter tyres in Norway. Buying Nordic winter tyres for use in the UK might seem like the answer but it isn't. Those on sale in the Nordic countries are very different as they are designed to spend at least 80% of their time on snow and ice, no more than 20% on tarmac. Those on sale in what the tyre manufacturers call 'Europe' or even 'central Europe', which includes the UK, are designed for the reverse: at least 80% on tarmac, no more than 20% on snow and ice. If you could obtain the Nordic varieties here, which you can't unless you import them yourself, they would have a very short life on tarmac and the handling might be less than ideal too. Just to emphasise that Nordic tyres and ours are quite different: from Nokian, central Europe gets the WR A3 and WR D3, Nordic countries get the Hakkapeliitta R and Hakkapeliitta 7. From Continental, we (central Europe) get the ContiWinterContact, they (Nordics) have the ExtremeWinterContact, ContiIceContact, ContiVikingContact, and ContiWinterViking. From Michelin, we get the Alpin and Pilot Alpin, they get the X-Ice 2. From Goodyear, we get the UltraGrip 8 or 9, they get the UltraGrip Ice+ and UltraGrip Extreme. From Pirelli, we get the Winter Snowcontrol and Sottozero, they get the Winter Carving Edge and Winter Ice Control. From Bridgestone, we get the Blizzak, they have the Blizzak Nordic and Noranza 2 Evo. Regarding:-Regeneratively speaking, considering all the warnings and indicators on modern cars, surely fitting a light to tell either the driver that a regeneration is due or underway is not beyond the wit of car designers. An HGV design that breaks down every few thousand miles due to a blocked DPF would soon be a pariah in HGV world, they'd be intouchable in weeks, lorry makes have a good image because they make a good reliable durable product, fashion branding doesn't feature to quite the extent it does in car world, if anything Swedish vehicles are generally held in far higher esteem than German lorry products. Many operators now lease the vehicles for 3 to 5 years under a full R&M (repair and maintenance) contract, remember HGV's are usually inspected every 6 weeks on average to hard work, recovering broken down 44 tonners every few weeks with wreckers that cost up to £250,000, so recovery isn't going to be a £iver, because some ill thought out regeneration system (where the owner/driver is in the dark to what's happening) would see the roads reduced to gridlock and the lorry maker very quickly going out of business. The lorry driver can also trigger a regen on some (don't know about all euro 6's) HGV's if necessary, i cannot believe car makers are still getting away with the idea a car's ECU is in sole control of regens, lunacy that you could travel an hour and the car suddenly decide to regen as you entered your home street.